Oxygen Software updates its flagship mobile forensic product, Oxygen Forensic Suite 2013, to version 5.1, making it easier to connect and acquire many types of mobile phones and greatly improving startup times and acquisition speeds. The tool gains support for Android 4.x backups, and integrates with Passware Forensic Kit for recovering passwords to many types of files. The new release of Oxygen’s flagship mobile forensic tool makes it far easier to connect and acquire communication devices such as mobile phones, smartphones and tablets. The new Oxygen Forensic ™ Extractor integrates connection, acquisition and backup extraction functionality into a single convenient tool. The new version launches quickly, and gives forensic experts a word of advice if an attempt to connect the device was unsuccessful. Connection and acquisition tips will help users avoid common connectivity and extraction problems without spending hours reading the manual. Manual device selection mode is made faster and simpler, allowing forensic experts to override automatically selected models with devices from the list. The updated device detection method now allows automatic device connection or manual override. In auto mode, the tool will automatically detect and select the device attached with a cable. If, however, there is a better match for a particular device, the manual mode offers a selection of device models and connection types that are available for those models. 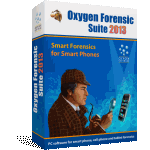 Oxygen Forensic Suite 2013 v5.1 adds the ability to import offline backups created with Android 4.x. The ability to analyze offline backups in addition to device analysis opens new possibilities of forensic examination. The tool supports plain and encrypted *.ab backups created with the help of ADB. Encrypted backups are supported if the correct password is known. Android backup analysis gives investigators access to the phone’s address book, messages, calendar, event log, file browser, application list, Skype activities, and so on. Oxygen Forensic Suite 2013 v5.1 can now integrate with Passware Forensic Kit, a tool for recovering passwords to many types of files. The newly added integration provides the ability to recover passwords for non-jailbroken iOS devices and iTunes backups using Passware Forensic Kit. Passware Forensic Kit software must be installed in addition to Oxygen Forensic Suite in order to enable this feature.